A large survey of experts in artificial intelligence suggests there is a 50% chance of AI outperforming humans in all tasks within 45 years and of automating all human jobs in 120 years. 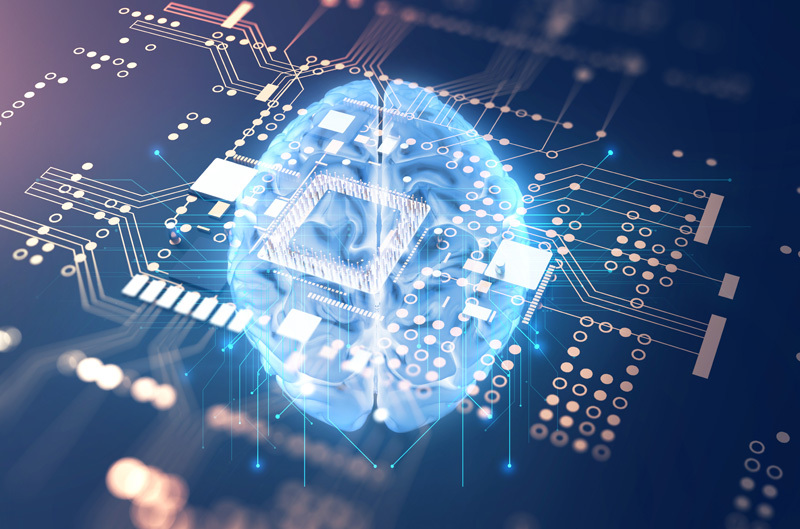 A team from the University of Oxford and Yale University has published a new survey that reveals experts' opinions on the likely timing of future milestones in artificial intelligence (AI). For this paper, they wrote to all researchers who had published at the 2015 NIPS and ICML conferences (two of the premier venues for peer-reviewed research in machine learning). Of the 1,634 authors contacted, a total of 352 (21%) responded. Questions given to participants concerned the timing of specific AI capabilities (e.g. folding laundry, language translation), superiority at specific occupations (e.g. truck driver, surgeon), superiority over humans at all tasks, and the social impacts of advanced AI. According to this survey, experts believe that AI will outperform humans in many activities in the near future, such as translating languages (by 2024), writing a high-school essay (by 2026), driving a truck (by 2027), working in retail (by 2031), writing a bestselling book (by 2049), and working as a surgeon (by 2053). Researchers believe there is a 50% chance of AI outperforming humans in all tasks within 45 years (shown in the graph below), and of automating all human jobs within 120 years. Aggregate subjective probability of 'High-Level Machine Intelligence' (HLMI) arrival by future years. Each respondent provided three data points for their forecast. Interestingly, Asian respondents predict these dates much sooner than North Americans. 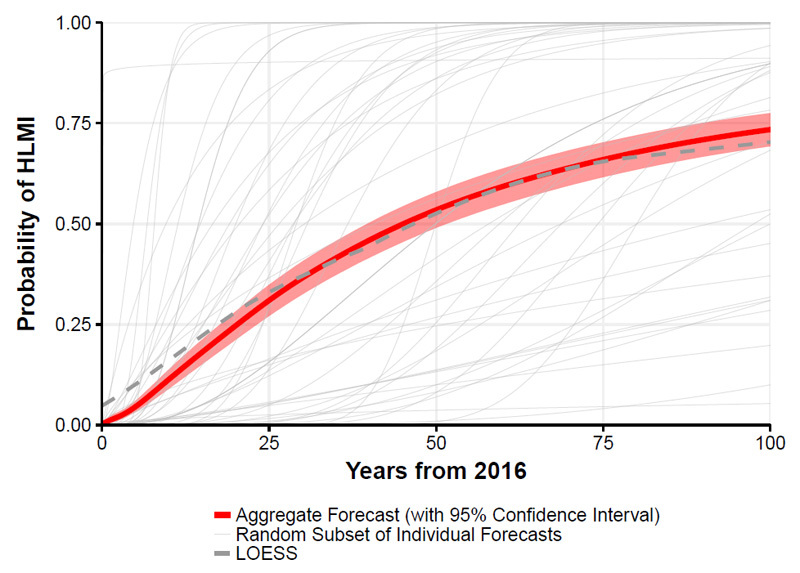 There was no correlation between the seniority of a researcher and the predictions they made. A majority of researchers believe the field of machine learning has accelerated in recent years, with 67% saying progress was faster in the second half of their career. While there is much hype and fear about the danger of robots, depicted in movies such as Terminator, the researchers take a more optimistic view about the longer-term future of AI. The majority believe it will benefit humanity, with only a 5% chance of being "extremely bad" (i.e. causing human extinction). "These results will inform discussion amongst researchers and policymakers about anticipating and managing trends in AI," the survey team concludes. Most of the questions focus on the cognitive aspects of intelligence that fit well-defined tasks. "But parts of intelligence – such as emotional intelligence – go beyond cognition," says Georgios Yannakakis, an Associate Professor at the Institute of Digital Games, University of Malta. "It would be interesting to ask when AI will surpass humans at being art or movie critics." The full survey results can be downloaded as a PDF at arXiv.org.